In Toronto, Ohio- the baseball team is the heart of the town. Immaculate facilities, great fans, and is almost always the case- a great product on the field. A few years ago, a young man named Blaze Glenn graduated from Toronto High School after earning four letters in baseball and captaining the team for two years. He was named the OVAC Player of the Year three times over as well as three-time First Team All-State with Ohio Player of the Year tabs in two of those years. If that’s not enough, he STILL holds (and may for a while) the Toronto High School batting average record at .583. After graduation, Glenn attended Sinclair Community College, where to no surprise to those who knew him, batted nearly .400 as a Freshman with double-digit home runs, and led his team to a conference championship, and All-Conference honors. Then it was his moment to shine. 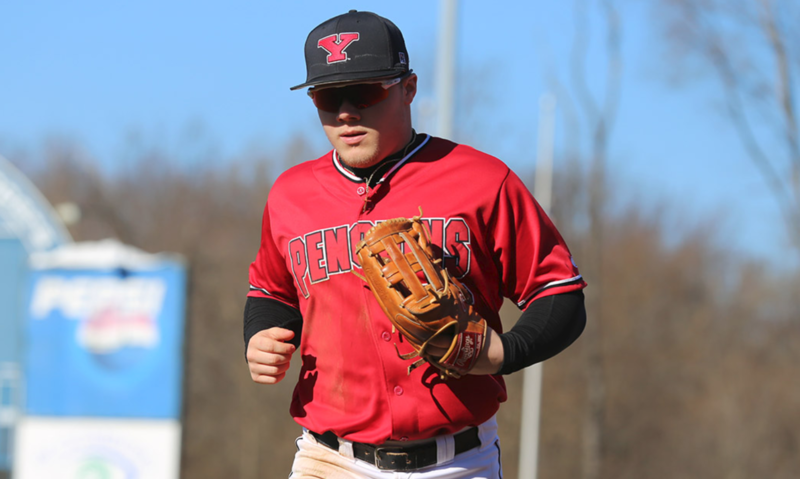 As Blaze would make the shift, and play Division 1 baseball by joining YOUR Youngstown State Penguins. Business (his major) was booming as Blaze would light the ‘Guins lineup on fire by starting all 56 games as a Sophomore. Glenn would reach base safely in 46 of those games, and would lead the team in batting average (.325), hits (64), RBI (43), slugging percentage (.558), and OBP (.445.) However, the most impressive trait that we found about Blaze Glenn, he’s still getting better. One of the hardest working athletes you’ll find, Glenn is always taking extra reps. You can often time find him in the cage before AND after practice driving himself and his teammates to be the best they can possibly be. Oh, and he’s not bad in the classroom, either. We mentioned before about his Business Administration major, Blaze, and his teammates were recently recognized for a team GPA of over 3.3. The best is yet to come this year, though. All you have to do is ask the fire-starter, himself.